1. 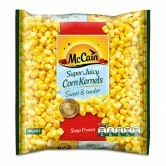 Put McCain Frozen Corn Kernels and asparagus into a medium bowl. Add egg yolk, flour, sugar, salt, and pepper. Stir to combine. 2. In a clean bowl, whisk egg whites until stiff but not dry. Fold into corn mixture. Heat 2 tablespoons vegetable oil in a large cast-iron or non-stick skillet over medium-high heat. 3. Drop spoonful’s of batter into the oil, spaced a few inches apart. Cook until golden on the bottom (approx. 1 to 2 minutes). 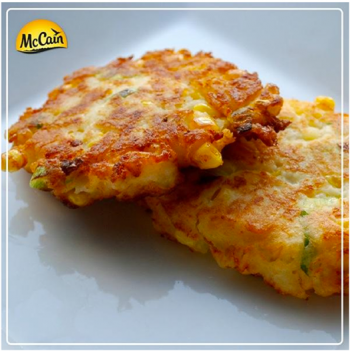 Using a spatula, turn fritters over and cook until golden on the other side. Repeat the process with the rest of the batter, using the remaining oil for pan. 1 Put McCain Frozen Corn Kernels and asparagus into a medium bowl. Add egg yolk, flour, sugar, salt, and pepper. Stir to combine. 2 In a clean bowl, whisk egg whites until stiff but not dry. Fold into corn mixture. Heat 2 tablespoons vegetable oil in a large cast-iron or non-stick skillet over medium-high heat. 3 Drop spoonful’s of batter into the oil, spaced a few inches apart. Cook until golden on the bottom (approx. 1 to 2 minutes). Using a spatula, turn fritters over and cook until golden on the other side. Repeat the process with the rest of the batter, using the remaining oil for pan.